Team Mummy is the company formed by a group of Spanish students of the School of Design and Innovation (ESNE) and "Trapped Mummy" is his first creation recently launched in the App Store and Google Play. In this platform title starring the pharaoh have Tutanramón II, waking mummified and is trapped in his own pyramid. Upon awakening will have to overcome more than 90 levels across 8 different worlds: Egypt, Prehistory, Underworld, Roman, Medieval, Victorian Era, Underwater World and the Future. 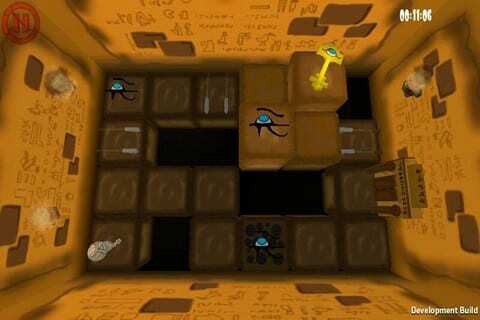 This escaping from enemies and avoiding various traps to meet our goal: bring the pharaoh of his grave. On stage we will attempt to collect the key to open the exit door and go jumping dodging obstacles and traps. In the game, we got to meet with 15 different traps, 13 enemies chasing you and 8 of them special. The task seems simple, but is a little tricky. You can find 'Trapped Mummy' in the App Store for free for a limited time. The article "Trapped Mummy", a platform game developed by Spanish students was originally published in News iPhone .